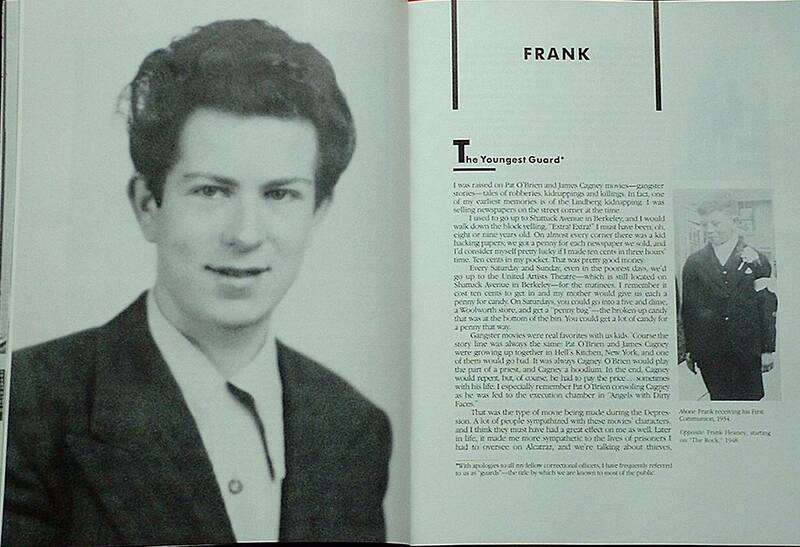 Frank Heaney at age 21, the youngest Alcatraz Guard. Even now I feel a chill when I hear that name. Product of the gangsterism of the '30s, Alcatraz was the escape-proof prison that sealed off men from the normal world. A world from which the headliner criminals of the day disappeared, banished from all that made up the pleasures and satifactions of life as we know them. Inevitable rumors of inhuman treatment, and wasted, hopeless inmates kept the public fascinated with "the Rock". But for many years no reporters were allowed, visitors had no real access to prison life, and even Hollywood could only guess, and of course they guessed the worst. But I was there. 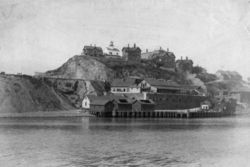 I was the youngest prison guard ever to serve at Alcatraz, and I saw first hand exactly what happened. Personally, I didn't mind the living conditions of the island at all. I lived in the bachelor quarters of the converted military chapel. For $10.00 a month, I got a bed and bureau, and my laundry done. Either I ate the same food as the inmates, or I ate with one of the families on Alcatraz, or I went to San Francisco for my meals. There was a lot of recreation for us: bowling and billards, dancing and card playing. There was a handball court that doubled as a gymnasium, a kid's playground, and areas for picnicing, fishing, and crabbing. Female guests of single men were not allowed in our quarters. It was a big deal for the guests you invited to visit the island. I never knew I had so many friends until I moved there. When they first arrived on Alcatraz, inmates were strip searched and given a complete cavity exam. These were usually administered by med techs, though the prison officers sometimes had to do it, not one of our favorite duties. They were bathed in the dimly lit shower room, and from then on they only showered once a week. Seven days a week of pent up frustration in 5X9 cells, meant that violence would be common. The method was usually by knifing. The assailant would usually get 5 or 6 of his buddies involved, almost always in the exercise yard. They would quickly surround the one that was going to get stuck. They generally stuck the prisoner in the stomach, sometimes in the side, trying to hurt him, but not kill him. These were warnings by prisoners of things to come. None of the prisoners ever saw these incidents, because that's the #1 rule among inmates, you never tell the "Man" what is happening. It was their society, their rules. One myth about Alcatraz that was quite prevalent was that there were dungeons under the prison. Actually there were areas underneath that had been used by the Army as cells to house the worst inmates, a practice that continued after the island became a Federal prison. The prisoners were kept down there in complete darkness, at times they were chained up against the walls. Inmates could be kept in the dungeons from a few days, up to a week depending on the severity of the incident. 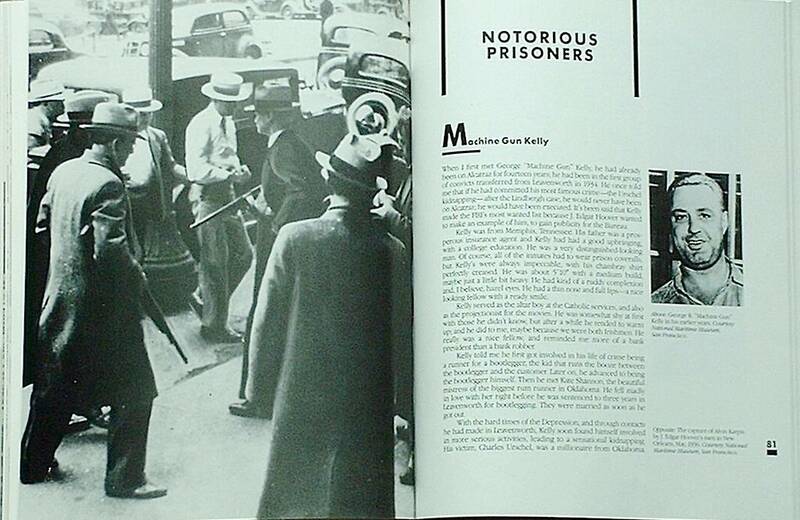 The underground cells were closed in 1940, after a judge declared them unconstitutional. He felt it was cruel and unusual punishment. D block's solitary confinment cells were built, and the worst inmates were housed there from then on. Robert Stroud first got into trouble in Alaska during the time of the Gold Strike there, right after the turn of the century. He killed a man in a barroom brawl. Now there are several different versions of the story. Some said he was a pimp and got into a fight over one of his girls, maybe someone didn't pay. 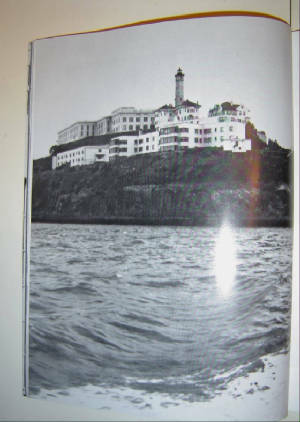 He arrived at Alcatraz from Leavenworth in 1942, was put into "D" Block which is isolation confinement. His IQ was 134, and he could read and write in four languages. But he was psychotic, subject to severe up and down swings in his moods. He never had any birds on Alcatraz, that was only at Leavonworth, but the name made good movie and newspaper copy. My book includes many historical pictures.